Here's a Thanksgiving lookin' Strat for ya! The zebrawood finish kinda gives off a wild turkey vibe, and check out the pilgrim hat knobs too! The body binding acts as garnish to help pull the entire feast together. 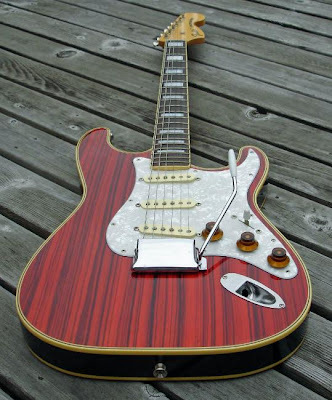 Another fine offering (sold) from the archives of www.guitarsjapan.com, you're looking at a Fender Japan 2002 RI of 1968's very limited Zebrawood Strat run. I know this is a Strat that folks will either love or hate-- and my turkey metaphor probably does little to help anything. You'd have to accessorize your wardrobe to play this one. I'd recommend a tan suede jacket with the long fringes, Saigon mirror shades, straw cowboy hat and Neil Young sideburns. Include a cream tolex Dual Showman with a bottle of Wild Turkey sitting on top, and you're there. So pass the cranberry sauce but don't take the brown acid. Just know that there aren't a bunch of these gobble gobbling around the earth. Even the RI was very limited due to zebrawood cost and acquisition issues. And is that a Jazzmaster neck?? Pimp Your Strat Directory -Mods, wiring diagrams, tips, tutorials and hardware upgrades suppliers.